In connection with my last post, I thought for this week's Pic of the Week I'd go along the line of trees (I feel like a bit of a tree hugger...lol). 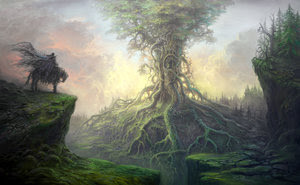 Introducing artist Jonas Jakobsson, or otherwise known as Yonaz on DeviantArt, and his piece 'TreeLife'. I loved this piece. I love the breathtaking beauty of the tree and the landscape, followed by the soft tones that give it an air of mysticism and fantasy. Be sure to check out his gallery. He has some magnificent work. Stunning picture. It's so eerie.